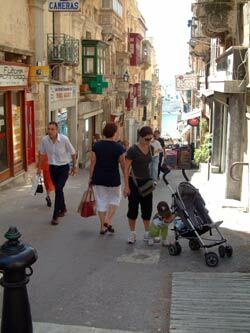 Valletta is a fascinasting city to visit for tourists. It is built on a promontory sticking out into the sea, its iron-grid pattern of roads intersecting each other at right angles, except near the sea where it's impossible to continue the plan. It's also the smallest capital city in the world making it very easy to sightsee on foot. If you walk from the main bus station, through the main city gate past the Auberge de Castille or Presidential Palace and into Merchant Street, you will find yourself in the wide main pedestrianised shopping area, very busy with tourists and shoppers. There is an excellent selection of shops, restaurants, pavement cafes all interspersed with churches and historic buildings. There is also a multiplex cinema/shopping centre off of this street. The roads to the sea both ahead and to the right go downhill and are lined by traditional buildings with overhanging balconies. Religious imagery is everywhere; in the street names,religious door plaques, life size statues of saints stand at street corners or there are niches in walls containing religious figures.